MCC Effect | Solid ground...are we there yet? Does the MCC Effect Exist? This is an interesting post at the Center for Global Development’s Rethinking US Foreign Assistance Blog summarizing the current body of knowledge to the effects of the Millennium Challenge Corporation’s (MCC) Eligibility Indicators. The blog itself is an interesting quick read, and has a lot of good links to different studies looking at the influence of the MCC in policy application. I would definitely recommend checking out the new study by Parks and Rice that inspired this CGD blog post. 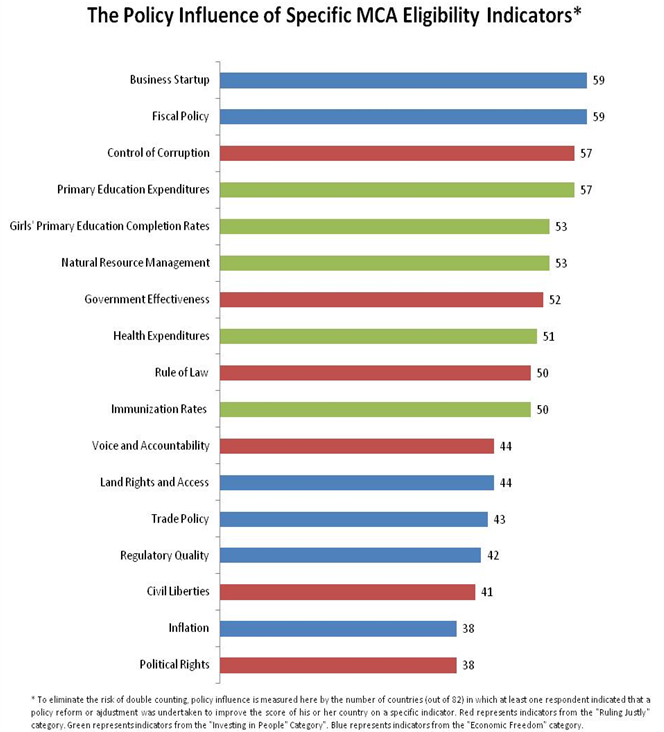 While it isn’t by any means a rigorous impact evaluation it is still an interesting survey looking at how MCC and other international indicators have influenced policy makers and development practitioners. I found two things found in the study particularly interesting. I thought this was interesting. It means that for many policy makers the indicators created by external agencies like the MCC serve more as a cover of legitimacy to making certain reforms. Meaning, that instead of creating a push for previously unlikely reforms, it is more a facilitating tool that enables or eases the process of gaining legitimacy on public reforms that were already on the table. This doesn’t mean that the indicators don’t have value, it just weakens the effect of external indicators. It changes the counter-factual. No longer are we talking about indicators leading to reforms that wouldn’t have happened prior to the indicators. Instead it is talking about facilitating the implementation of reforms that were already being considered. Politics matter, and politicians like all individuals respond to incentives. These incentives greatly impact how influential the specific MCC indicators are towards pushing reform. I copied and pasted the following graph from the Parks and Rice study because it illustrates the limitations of external indicators in influencing policy makers when they contradict local socio-political incentives structures. As we can see the more political the indicators get the less readily they are accepted by policy makers in their decision making progress. Does this mean that these political indicators should be dropped? Probably not, but it just suggests that we should be realistic as to how influential external indicators can be, and try to build up awareness of how these indicators are tied to beneficial results that have short-term as well as long term benefits for implementing countries, and perhaps more importantly potential reform implementer.